+passive=spear point touch causes .5 heart damage(on foot just walking/standing). Sprinting does 1 heart. -touch damage increased substantially on horseback. Reliant on horse speed. -2 to 3 block range. Not 0 to 1. To make mounted melee combat actually feasible, functional and fun. Melee range of 0 to 1 on horseback makes mounted melee combat useless at worst, unreliable at best. You miss more than hit. 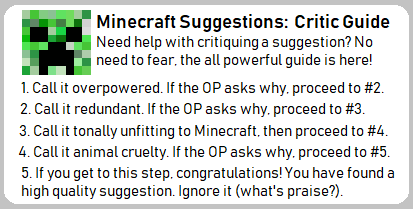 +Fearmonger(horseback only): Chance to make a Mob panic or freeze. Why not just post this on the original page? The original page has...a lot on it. I have heard anyone who has pull hates TLDR content like what was discussed. So I figured a new thread that was summarized (yes...that is summarized) would be better. While also hoping and praying that...I didnt break any rules...by doing this. Especially if my idea is blacklisted because of it. Please continue to post in that thread. A new thread is not allowed when the old thread is still active.